A Sclera tattoo is a tattoo on the white area of the eyeball. In 2007, the first tattoo experiment was done by Howie, of Lunacobra.net, on three men with sighted eyes: Shannon Larratt, Pauly Unstoppable and Josh Rahn. This procedure was inspired by Rachel Larratt's eyeball implant, where a platinum star was implanted into her sclera. Many others have been done since then but it is still very new and can be dangerous. The method of injecting eyes with tattoo ink was invented by Shannon Larratt. Unlike regular tattoos, sclera tattoos are irreversible; laser removal cannot be done on an eye. 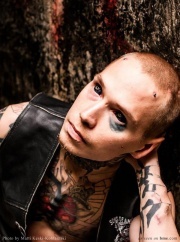 In 2012, sclera tattoos increased in popularity. This is a very new procedure so there may be other unknown risks. This page was last modified on 4 March 2013, at 01:33. This page has been accessed 48,228 times.